A Totally Kiler Music/MP3 Blog. It's pretty obvious I've been feeling a bit nostalgic lately. 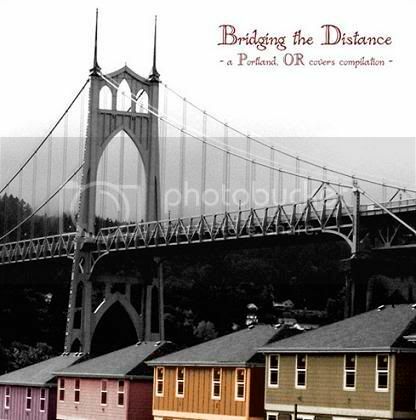 To wind down this brief detour into yesteryear, I offer a couple of tunes from the April 2007-released Bridging the Distance compilation. As the title alludes to, this album is a collection of Portland-based bands covering 70s and 80s (mostly) classic rock tunes. Notable contributing bands include indie heavy weights The Decemberists and Spoon's Britt Daniel, along with numerous up-and-upcoming acts such as Viva Voce, The Joggers, and The Thermals. The complete track list can be viewed here. I'm generally uneasy when it comes to any sort of tribute or covers compilation, as they are often completely unnecessary, glorified whack off sessions. But this compilation is for a good cause (Portland homeless youth mentoring program, p:ear) and offers enough variety to keep things fairly interesting. The source material is primarily FM classic rock radio staples and a number of the usual suspects are present-- the Boss, Skynyrd (dude), Fleetwood Mac, ELO, and Yes. It's always risky to completely deconstruct and re-envision a classic and well-loved tune, but the most successful songs here are ones that take a radically different approach from the original. The Minus 5 take Lynyrd Skynyrd's tale concerning the trappings of rock stardom, "That Smell" and render it more somber by stripping the song down to its core. Most interestingly, singer Scott McCaughey manages to hit some notes that sound remarkably Jaggeresque. (think: the verses of "Angie") And with the minimal arrangement, the song's cautionary theme resonates loud and clear. The dudes of Blizten Trapper tackle Heart's "Crazy on You" and re-imagine the Guitar Hero II highlight as a synth-pop gem that wouldn't sound out of place on an Of Montreal album. A simple vocal hesitation during the chorus gives the song a slightly different feel, and with the wall of electro beeps and buzzes, it all works surprisingly well. The compilation standout comes from Whip, a one-man project and pseudonym of Portland songwriter Jason Merritt. Merritt's haunting folk rendition of Billy Idol's "White Wedding" is so far removed in sound and spirit from Idol's 80s anthem it feels like a completely new song. Employing minimal acoustic strums, sparse banjo plucking, and despondent vocals, Idol's fist-pumping rocker is effectively remodeled into an affecting, woeful meditation. Don't be surprised to hear this one popping up on a film or television soundtrack or two in the near future. The strength of this tune and the compilation's charitable cause more than justify its reasonable $10 price tag. You can snag Blizten Trapper's version of "Crazy on You" over on Stereogum. All MP3 files linked to on this site are available for a limited time and are for sampling / evaluation purposes only. I'm simply here to promote artists and music I enjoy. Do your part by supporting the artists who create this great music. If you represent an artist and you would like a link to a file removed immediately, just let me know. The White Stripes - "Rag and Bone"
Common - "The People" & "The Game"
Modest Mouse - "King Rat"